Thousands of people have attended a lavish party to celebrate Zimbabwe’s President Robert Mugabe’s 89th birthday in the mining town of Bindura. Robert Mugabe was presented with a cake said to weigh 89 kg (196 lb), and gold coins were minted to mark the occasion. The celebrations cost about $600,000, reports say. In his speech, Robert Mugabe – who has ruled since 1980 – denied claims that he was trying to intimidate political rivals ahead of a new election. Robert Mugabe will be contesting the election later this year, hoping to secure another five-year term in office. The day before of the celebrations in Bindura, residents were given an hour off work to clean the town’s streets. Wearing an elegant suit and a red cap with his year of birth, Robert Mugabe waved to the crowds, flanked by his wife and two children. He later cut the birthday cake and released 89 balloons into the sky. Robert Mugabe also urged his supporters to go “forward with winning elections, down with imperialism”. 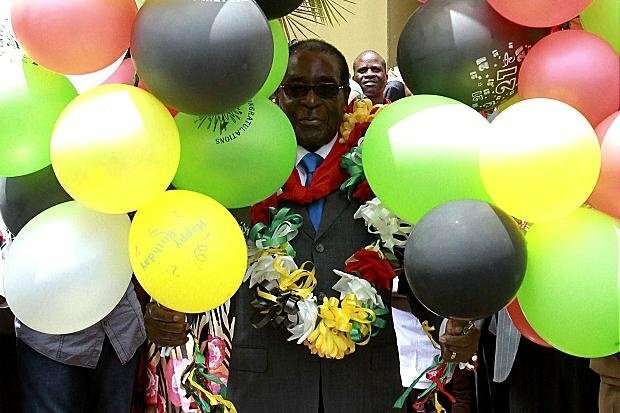 Robert Mugabe’s actual birthday was nine days ago, but this weekend was the chance for his supporters to celebrate. Zimbabwe is now moving towards a crucial period of political transition. Robert Mugabe adds that a referendum on a new constitution will precede the presidential elections. The polls would herald the end of a shaky government coalition between Robert Mugabe and his rival Prime Minister Morgan Tsvangirai. The coalition between Robert Mugabe’s Zanu-PF party and Morgan Tsvangirai’s MDC party was formed under pressure from regional leaders after the disputed 2008 election.